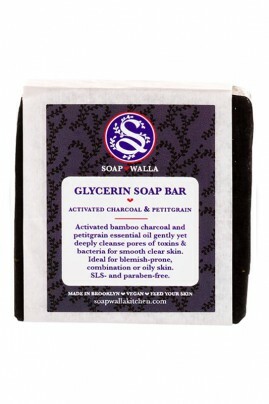 Feed your skin with Soapwalla’s Glycerin Activated Charcoal & Petitgrain Soap Bar, designed to clean and soothe sensitive skin without leaving a film, while nourishing and removing unhealthy toxins. The combination of activated bamboo charcoal, petitgrain and tea tree essential oils gently yet deeply cleanse pores of toxins and bacteria. This Soapwalla Natural Soap Bar is ideal for all skin types, especially blemish-prone and combination skin. Your skin is smoother and clearer ! SOAPWALLA Vegan Soap Bar maintains a matt complexion and refreshes the epidermis ! Use everyday SOAPWALLA Soap Bar over wet face and lather. Then rinse off with tepid water. Natural ingredients to gently clean your skin !